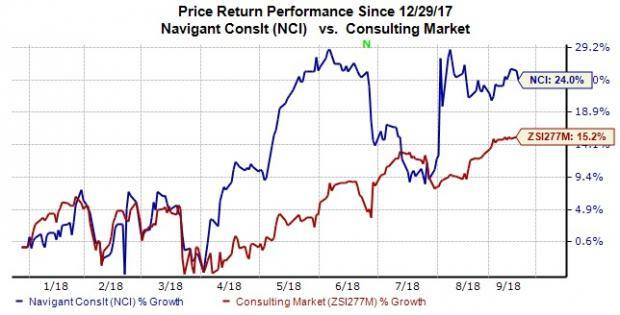 Here we discuss about Navigant Consulting, Inc. NCI, a stock that has rallied 24% year to date, significantly outperforming the industry’s 15.2% growth. We believe the stock has the potential to exceed expectations moving ahead. The reasons behind our optimism include the company’s transformation initiatives and technology investments. The long-term (three to five years) expected earnings per share growth rate for the company is 13.5%. Navigant is in the process of transforming from an expert-based organization to a more industry-focused management consulting and managed services firm. Notably, the recent divestment of the Disputes, Forensics and Legal Technology segment, and Transaction Advisory Services (“TAS”) practice to Ankura Consulting Group, LLC is a part of this transformation. The strategic move is expected to help the company achieve higher growth, more streamlined operations and significant capital flexibility. Navigant recently launched a joint venture — Health System Solutions — with its partner Baptist Health South Florida. It is aimed at providing revenue cycle management (RCM) services to healthcare providers. The collaboration is expected to contribute significantly to Navigant’s RBR growth, going ahead. Navigant is consistently investing in technology infrastructure to augment its technology-based service offerings so that it can efficiently meet the changing demands of its clients. The company has invested in development programs that are aimed toward improving sales effectiveness and collaboration across the organization. Its other focus areas include employee development, talent management and mentoring programs. We believe that these initiatives should add to Navigant’s ability to grow its business organically. Navigant currently carries a Zacks Rank #3 (Hold). A few better-ranked stocks in the broader Business Services sector include Heidrick & Struggles International HSII, BG Staffing BGSF and Insperity NSP. While Heidrick & Struggles International sports a Zacks Rank #1 (Strong Buy), BG Staffing and Insperity carry a Zacks Rank #2 (Buy). You can see the complete list of today’s Zacks #1 Rank stocks here.